eBay Mobile, one of our favorite iPhone business apps, just got better. This tool for on-the-go buyers and sellers lets you bid on items, check prices, and answer customers' questions. 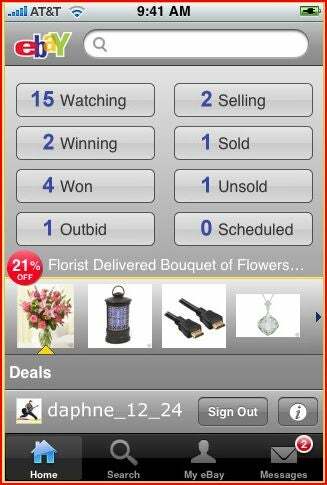 Its newest release, available now at the iTunes App Store, also will send push notifications to bidders when they've been outbid, or when an auction is nearing completion. Upon receiving a push message, bidders can either tap the "View" button to take action (such as upping their offer) or touch "Close" and forget about it. Another new feature, Integrated Pay with PayPal support, allows buyers to pay for some items from within eBay Mobile, rather than having to resort to a conventional computer or the iPhone's built-in browser to complete a transaction. Also new is the ability to search completed items and descriptions. Early reviews by App Store customers were mostly positive. "The new update is great. I can finally pay on my iPod Touch and I can also read some of the feedback others have left! Glad to see the added push notifications as well," wrote a user named "Psycho C."
"Kw83028" also praised the upgrade, but added a few tips on how to improve eBay Mobile: "This update has almost everything I need. Cons: completed listings need to be more distinguishable like on the website." eBay Mobile will soon allow you to create auctions using images you've taken with your iPhone, according to the company.